Stereotypically a popular destination for lads’ holidays, Amsterdam is actually a really great all-round city break. Visitors can walk along the canals, explore the little streets and shops or hire a bike to see the city like the locals. A visit to the Anne Frank Museum is sure to be an emotional experience and the Van Gogh Museum is a must for some culture. There is no end to the exploring you can do, but whatever you do, definitely get some chips and mayonnaise! The ideal city for sun worshipers, history enthusiasts and architecture fans; Athens certainly offers plenty to see. The city was given a huge revamp for the 2004 Olympics and now it is a bustling metropolis set in ancient scenery. As the ‘home of the gods’, visitors will be surrounded by culture. Ancient Greek sites are ripe for exploration, such as the Acropolis and the many fascinating museums. This bustling Spanish city offers great weather, lively night life, striking art work and wonderful architecture. Food lovers will not be disappointed with wonderful dining options and the opportunity to sample traditional Catalan flavours. The city is smattered with intricate Gaudi architecture, making it a haven for design enthusiasts; what’s more, Barcelona boasts the Picasso Museum as well as the notable Museu Nacional d’Art de Catalunya (MNAC). Oh, and there’s also miles of wonderful sandy beaches too! A superb location for lovers of music, fashion and art, not to mention architecture and history; Berlin really does offer something for everyone. A fun-packed European city, Berlin offers incredible night life, with clubs that stay open well into the daylight hours, and great beer too. Visitors wishing to explore some of Germany’s more recent history can walk along the remains of the Berlin wall and visit the Checkpoint Charlie border control which is now a tourist centre. A glamourous city with a dizzying skyline; anyone who adores really hot weather, bright sunshine and shopping will love Dubai. Explore the Arabian architecture, shop the precious metal souks for some amazing jewellery, and venture into the desert, perhaps by hot air balloon for an aerial view. For the sun-worshippers, Dubai’s golden-sand beaches provide the perfect spot for games, picnics and swimming in the Gulf Sea. The Dubai Mall is the world’s largest indoor shopping centre offering around 1200 stores, along with an ice rink, aquarium and indoor theme park. After all that shopping you can relax in one of Dubai’s numerous laid back coffee shops or shisha lounges. Madrid is another excellent location for those looking to extract every last drop of entertainment from their holiday. During the day you can enjoy the weather, visit museums, and explore the streets, before throwing yourself into the lively night life. With succulent food, brilliant music and heart-racing flamenco dancing, you can party all night in the many fantastic clubs. If you’re seeking culture rather than the party-scene, Madrid also has a host of incredible must-see sights such as the Royal Palace and the Museo de Prado art gallery. Some sights stand out, even amongst the magnificence of the others; no trip to Madrid would be complete without a visit to the Plaza Mayor. A true ‘must-visit’ destination, you’ll relish the energy and buzz of this busy metropolis. With more shops than you can shake a stick at, shopaholics will be in heaven, but make sure you save time to visit some of New York’s iconic sights. 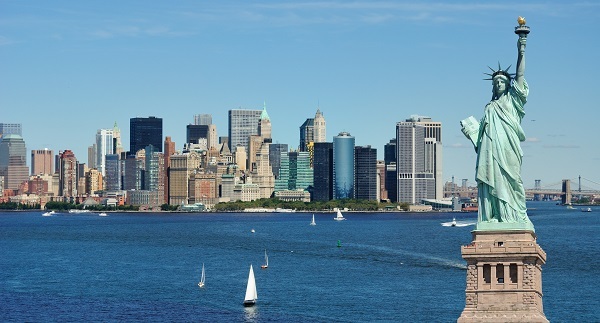 A boat tour is the ideal way to take in the Manhattan skyline including Liberty Island, home to the Statue of Liberty. Many visitors compare a trip to New York to visiting a film set, with so many familiar locations from blockbuster films and your favourite TV shows. Grab a hot dog in Times Square, catch a show on Broadway, and then hail a big yellow taxi to take you back to put your feet up in your hotel. Hailed as the city of love and romance, whatever your occasion for visiting, Paris is an extremely popular city break destination. Famous for fashion, art, wonderful French food and of course the Eiffel Tower, Paris is a city with it all. There are some sights you simply must see, such as the Louvre; home to the Mona Lisa, Sacre-Coeur and the impressive Notre Dame. For the kids, of course no visit would be complete without a trip to Disneyland Paris. Remarkably easy to get to, thanks to the Eurostar, you’ll love a short break or longer trip to Paris. The ultimate destination for history, food and culture lovers; Rome has an unending list of things to see and do. Best enjoyed by simply relaxing, strolling around and truly taking in the culture and atmosphere; a trip to Rome would not be complete without a visit to the Colosseum and of course the Trevi Fountain. Other notable sights include St Peter’s Basilica and the Spanish Steps, though stopping for lunch at one of Rome’s wonderful restaurants for some traditional pizza and a glass of local wine, is also an experience not to be missed. A bustling city, Marrakech offers visitors a unique city experience. Explore thriving souk marketplaces to buy traditional textiles, pottery and jewellery – where haggling is a must – and sample spicy Moroccan cuisine from a street vendor. Established in medieval times, the walled city of Marrakech is dappled with awe-inspiring architecture such as the Koutoubia Mosque. Wander around the cool interiors of many of these buildings to view some of the intricate Islamic art and décor. Marrakech is also the home to fascinating crafts, beautiful gardens and intriguing museums. Even if you’re taking a short city break, it’s important to make sure you’re covered just in case your trip doesn’t quite go to plan. In the unlikely event that something unfortunate happens, you’ll want to be prepared. Find out here about the high quality cover we can provide for city breaks, whether you’re staying in Europe or travelling further abroad.